Best known as a seasoning, bay laurel is an evergreen shrub or tree that is native to the Mediterranean area. Although bay can grow into a tall tree, it is often kept smaller by pruning or by confining it in a container. Because bay is a very slow grower, it can be grown as an ornamental and it is even more suited to growing in a pot. It has attractive foliage and can easily be pruned and sheared into topiary shapes. In the spring, sweet bay has small yellow flowers which develop into purple berries in the fall. Frequent pruning will mean fewer flowers and berries. Bay laurels are versatile plants that can thrive indoors and out. They make attractive houseplants but they will benefit from some summer sun. The leaves will produce the best flavor if the plant is given full sun for a portion of the year. Bay laurel is used in stews, soups, tomato sauces, on fish and pretty much anywhere you want a subtle, earthy flavor. Bay is also a traditional component of the French bouquet garni herbs. The dark green leaves are very fragrant, especially when dried. As a seasoning, dried leaves are broken or crumbled into cooking foods and allowed to permeate the dish. The leaves don’t soften much in cooking and are removed before eating. The leaves are also used to make wreaths and garlands. Bay has also been a traditional medicinal plant, with uses as varied as earaches, rheumatism, and insect repellent. But be advised that some people find sweet bay to be a skin irritant. If you grow your bay tree indoors, keep it near a sunny window for the winter. Avoid exposure to both drafts and heat from appliances. Outdoor plants require full sun to partial shade. In areas with hot, dry summers, some afternoon shade is ideal. This tree is not too particular about soil. 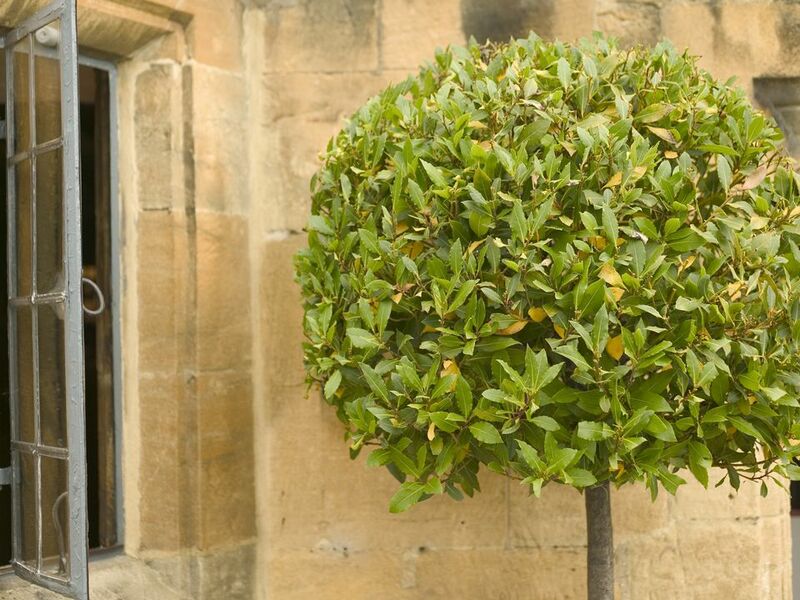 Well-draining soil is important; plant your bay tree at the same depth as it was planted in its original pot. Bay roots are very shallow and frequent watering may be necessary during dry spells. Use caution when weeding or cultivating around the base of the tree. Water it regularly but always allow the soil to dry out between waterings, so the roots don’t rot. Although your bay tree will probably go dormant and drop a few leaves, you do not want its soil to sit dry for extended periods. Bay is only hardy in USDA Hardiness Zones 8 through 10. In cooler areas, bring it indoors for the winter. However, you may have trouble keeping your indoor bay tree from drying out in the low humidity of your home. When it signals trouble by dropping a few leaves, use the leaves in cooking and begin misting the tree regularly with water. Since bay is slow growing, it doesn’t require a great deal of food. Plants in containers need some supplemental fertilizer. Feed container grown bay in the spring and maybe again mid-summer, with a balanced organic fertilizer like fish emulsion and kelp. It also helps to refresh the top couple of inches of soil each spring, being careful not to hurt the shallow roots. Bay makes a popular container plant that can live for decades. To keep its size in check, use a small container. Just make sure it has a broad enough base to keep the tree from toppling over in the wind. A 24-inch pot should be fine for a 4- to 6-foot tree. Bay seems to grow best when a little cramped in its pot, even to the point of roots starting to poke out the bottom. You shouldn’t need to re-pot more than once every five years. Bay is very difficult and slow to start from seed, so most trees are purchased as seedlings. You can start them from seed, but be prepared to wait up to 6 months for the seeds to germinate. It’s very important that you only grow plants labeled Laurus nobilis if you plan to use it for cooking and eating. There are other plants that go by the common names of bay and sweet bay and these are not necessarily edible. There are also a few ornamental cultivars of Laurus nobilis. Whether they season as well as regular Laurus nobilis is a matter of personal taste. Laurus nobilis "Angustifolia": Also known as willow-leaf laurel, it has narrow leaves. Laurus nobilis "Aurea": New foliage is yellow. Laurus nobilis "Undulata": The edges of the leaves are rippled or wavy. If left unpruned, bay trees can grow 60 feet tall. Container grown trees and trees that are regularly pruned will not get anywhere near that tall. To keep your potted bay tree portable, keep it pruned to no taller than 5 to 6 feet. Bay is often kept pruned, either to keep the size in check or to create a more ornamental tree. Pruning is usually done in the spring, as new growth is just beginning. You can prune as much or as little as you like, to keep the tree small or to create a topiary artwork. You can begin harvesting leaves when your tree is several feet tall, but you can always use the pruned leaves in the meantime. Even leaves that dry and fall off the tree are still fragrant and usable. For the most part, the bay is pest free. It is often used to deter pests from other plants and in the pantry. Scale can sometimes become a problem and there are moths that will lay their eggs between two leaves and sort of fuse them together with a cottony fluff. If you see two leaves that appear to be stuck together, gently peel them apart and remove the eggs or larva. If your bay is hit by a light frost, the leaves will probably turn brown and dry. Often the tree will recover on its own, the following spring. If your tree does show signs of die-back in the spring, prune the stem down to below the damage and new growth should fill in. In extreme cases, prune to about 6 inches and allow new shoots to form from the base.